In the 10 years since the first homesites were sold at Martis Camp, architecture has become an important part of our legacy. By encouraging self-expression and creativity, our community’s diverse residential architecture has become something to celebrate and share for generations to come. On Saturday, as part of that celebration, the doors open to 18 remarkable Martis Camp homes for our annual Architecture Open House Tour. 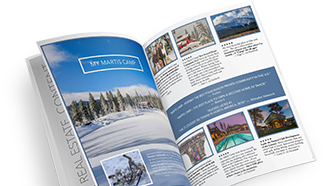 If you’re thinking about building or buying a house at Martis Camp, this tour is a fun and productive place to start. Members can begin the tour by picking up a map of open homes between 10:00 a.m. and 4:00 p.m. at the Springs Pavilion. Select the homes that interest you and set out on a self-guided tour throughout the community. Walk through the interiors to see the floor plans, features and décor. From mountain modern expressions to traditional Tahoe chalets, each home has a charm and beauty of its own. Some of the architects, builders and designers with projects at Martis Camp will be on site to share their work with you. Feel free to ask questions, learn about the process of building a home and find inspiration in the unique architecture and finishes on display. Martis Camp Architecture Review recently reached a milestone when the 500th custom home was submitted for design review. With more than 100 homes under construction and 300 homes completed, a variety of custom homes in both of these categories will be open for the tour. We hope you’ll join us after the tour for an informal cocktail hour. Members are invited to gather at the Springs Pavilion at 4:00 p.m. Don’t miss this opportunity to get to know your future architect, builder or designer. If a turn-key home is what you’re looking for, we hope you’ll get in touch as well. Martis Camp Realty will be showing additional homes and homesites for sale throughout the day. Whether you’re designing from the ground up or in search of your perfect completed cabin, the Architecture Open House Tour just might be the key to making your Martis Camp dreams come true.